lace cord made by my daughter, originally uploaded by sunshine's creations. My oldest daughter has made 28 yards so far and as you can tell there is still more there for her to make. She is only 14 so I believe all children can learn this skill. My 12 year old and 10 year old knows how to aswell, but she just dosen't want to make the cord. Maybe in time the other two daughters will want to. My oldest is trying to help me make cord for the tutorials I will be doing this year as it will take 100's and 100's of yards to make all the items in the master list. 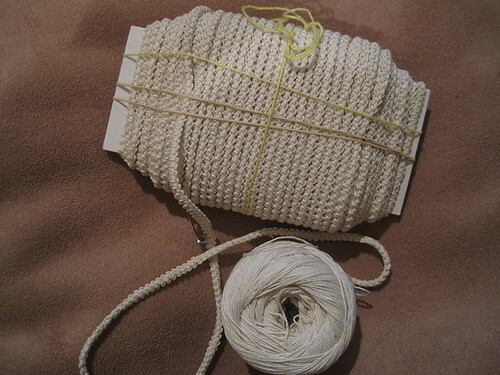 I am trying to do most of the tutorials in basic Romanian cord just because it is easier to photo graph and film. Very traditional is whites and creams but I have seen lots of color used in older pieces as well. Crafts change with the times and the use so I have no issue with adding color to my work I hope you don't either just more festive that way.